After fishing for Lake Trout all summer at our lodge located on Aylmer Lake in the Northwest Territories, it’s time to move from sea legs to land legs. We arrived home and things are well under way at our hunting lodge. Now we shift our eyes from seeking fishing opportunities on water to watching the skies. We’re busy assessing the fields for great places to set up for the spectacular numbers of Canada Geese, Speckled Belly, Mallard and Pintails ducks that pass over McLennan using three major fly ways to head south for the winter. Even way up here we’re no immune to the crazy weather happening around the world. For us, it translated into late crop harvest and the birds stacking up in a few fields gorging on peas. Peas are the first crop to be cut, followed by canola, then either wheat or barley depending on which one is ready for harvesting. as the birds head out of the Arctic, we are traditionally the first farm fields where they can stop and gorge on legume and grain to fatten up for the massive exodus south. These flocks have hundreds of thousands of naive birds, that have never been shot at. NO, this is not a typo. At Kimiwan Lake in McLennan (where our lodge backs unto the lake), we hold approximately 250,000 birds. Nearby, Lac Magloire Lake holds approximately 100,000 birds, and Winagami Lake holds thousands of species of waterfowl. Then we have countless ponds and rivers. Each time we climb into the blinds, we get to see our world through the eyes of waterfowl hunters who are passionate about hunting birds. Our clients are blown away by the sheer number of birds. 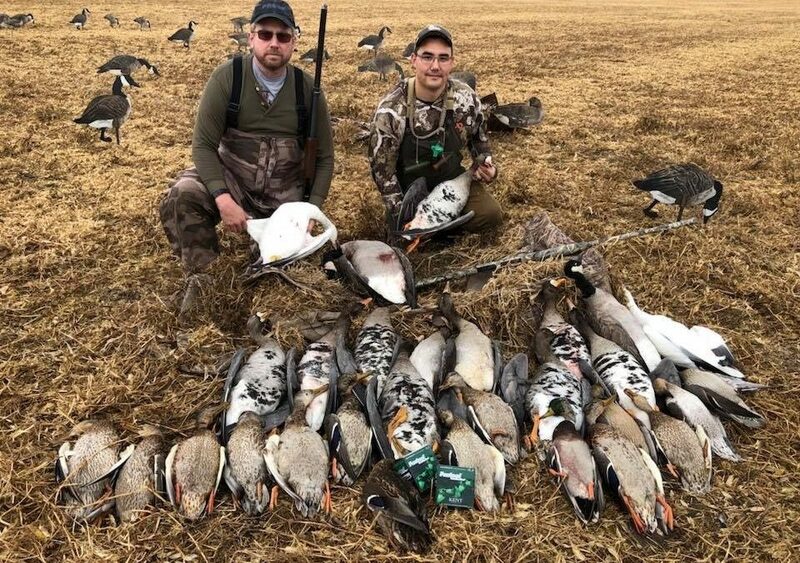 Do we limit out every hunt? nope…it’s hunting. There are a tremendous amount of shells fired and YES, 8 geese, and 8 ducks can be an elusive number at times. But let me tell you – we have fun. We have seen more birds in a single shoot than our clients might see in an entire season. And YES, you get to repeat this for 5 shoots on a three-day hunt. Nothing beats dry land hunting in the Peace Region! We relax in layout blinds and watch tremendous sunrises and sunsets – while in between these two amazing visuals we hunt waterfowl.